One of the most generic personal finance suggestions is to “create a budget.” The advice usually revolves around setting aside money from your paycheck for all of your known expenses, then making smarter choices with what’s left over. Here’s the problem with that suggestion: a lot of people who are in financial trouble have no idea where their money is going from month to month. I’m speaking both from my own experience and from the mountains of emails I’ve received from readers who are struggling to get control of their own finances. Between impulse buys, credit card purchases, debit card purchases, purchases made with pocket money, and so on, it can be extremely difficult for a person without at least some exposure to personal finance to understand where their money goes. Without knowing where your money goes, a budget is useless. It’s nothing more than a guess about the reality of your financial situation. The first step, then, in creating a budget and getting your financial life under control is to understand as completely as you can where every dime of your money is going. I suggest doing this for a period of at least one month. This allows you to get through one billing cycle on your utilities and your debts. While it does not cover irregular bills (like insurance), it can at least provide the foundation for regular monthly budgets. What I did is I designated a shoebox in which to collect receipts for every dime I paid out for a given month. If I bought gas, I saved the receipt and put it in the box. If I bought groceries, I did the same. The same goes for all of my silly incidental expenses. If I paid cash for something and didn’t receive a receipt for it, I would write down that expense on a piece of paper and toss that paper into the box. My regular bills also went into the box after I paid them. If I paid the bill online, I would write down the bill name and the amount on a piece of scrap paper and toss it into the box, much like my cash expenses. At the end of the month, I would also take my bank and credit card statements and use those as a basis for comparison to make sure I didn’t miss anything, like an automated payment that I forgot about. What do you do with all of this information? Simple. You take all of it out and sort it into groups that make sense for you. For example, you might have a group for essential bills (like electricity and rent or your mortgage payment), a group for non-essential bills like Netflix, a group for groceries, a group for eating out, a group for entertainment and hobby expenses, and a group for everything else. 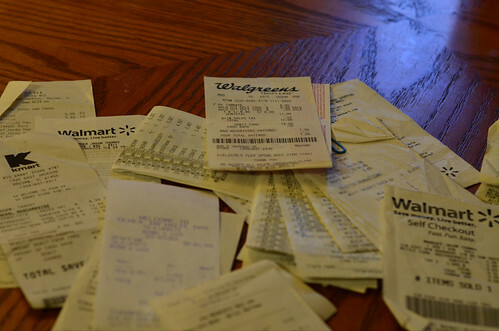 Then, go through each of these groups and total up the receipts in that group. Once you have those totals, you can spend some time asking yourself whether that spending level needs to stay in place (for example, with essential regular bills) or it can be cut a little bit (as with entertainment expenses or eating out). What do you have after you’ve done that? A budget. That’s the end result of all of this work: a budget that actually matches how you spend your money and provides realistic guidance for your financial future.